The National Museum of Fine Art is once again hosting Arte y Moda "The Art and Fashion Project". Therefore contemporary art will repeat its feat of casting down the barriers of traditional creations and set down a personal discourse in which pre established canons lose their autonomy, while thematic variety, artistic manifestations and expression modes multiply. Once again the top fashion designers of the Island will take over the night showing us their original works. 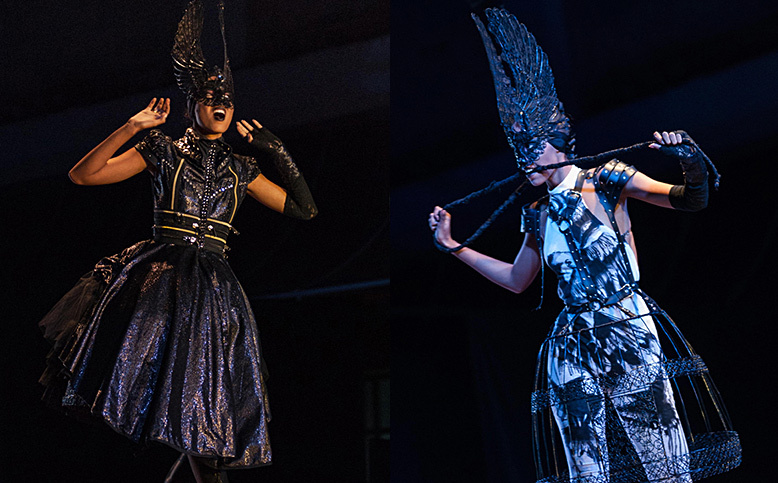 Using recycled and unconventional materials the artists collaborate to create extreme suits full of art, passion and imagination showing the ample gamut of contemporary artistic expressions. Design by Pavel López and Guido Asenjo from Santa Clara, inspired by the work In the Hurry of the Leaks, by the plastic artist Guido Asenjo, of the Remixed Collection, in Art and Fashion, in the National Museum of Fine Arts in Havana. La Arte y Moda en el Museo de Bellas Artes y con este volvió el arte contemporáneo a quebrantar las fronteras de creación tradicional, y a instaurar un discurso propio en el que los cánones preestablecidos pierden autonomía y se multiplican las posibilidades artísticas y los modos de expresión. Diseño de Pavel López y Guido Asenjo de Santa Clara, inspirado en la obra En la prisa de las fugas, del artista de la plástica Guido Asenjo, de la Colección Remixed, en Arte y Moda, en el Museo Nacional de Bellas Artes, en La Habana.